Microsoft(s msft), meet Mint. Just in time to plan your holiday shopping budget, personal finance app Mint is finally available on Windows 8.1 and Windows Phone 8 starting today. The app is free and ready to download from both the Windows and Windows Phone app stores. Mint’s group product manager Vince Maniago says they should appear in the next release. And since the app is brand new, updates are expected to arrive every week. 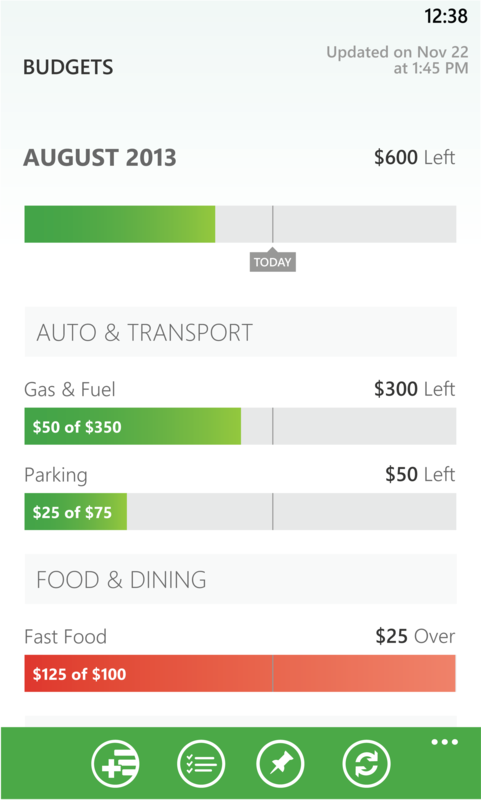 Missing charts aside, the new apps take good advantage of Windows’ Live Tile support. The apps allows you to pin any account, transaction stream, overview or budget right to your home screen, for quick financial updates whenever you use your device. It’s good to see another popular app make its way over to Windows, or more specifically, to Windows Phone, which still lacks many apps when compared to the competition. And with over 13 million registered users, the new Mint apps will surely make some Windows users very happy. As of 11:41 am EST, Mint is not on the 8.1 desktop store.